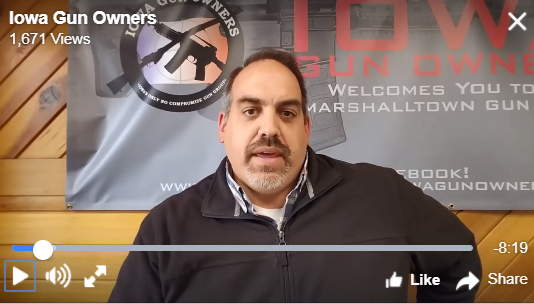 VIDEO UPDATE on Gun Control Bill in D.C.
As the demands for gun control continue to mount in the wake of the Las Vegas shooting, members of the Iowa Congressional delegation are beginning to give in to the pressure. That’s why we’ve prepared this video update for you. Please take a moment to watch this video now! When you’re done, please do four things right away. >>> First, share this video with all of your pro-gun friends and family so they can be informed and take action! >>> Second, contact the members of the Iowa Congressional delegation right away, using the information below, and insist that they oppose any and all forms of gun-control! >>> Third, sign your petition opposing any gun control in DC! >>> Fourth, become a member of Iowa Gun Owners. No one fights harder in Des Moines to defend your rights, but we need your help, so get involved today. P.S. With Senator Joni Ernst and Congressman David Young already giving in to the demands for increasing gun control this week, it’s important that you take action right away. That’s why we’ve prepared a video update for you. Please watch it, and then take action right away.